Wayfaring Wanderer: I've Got A Fever!?!? In a little over a month, the signs of spring will be plentiful. these roadside daffodils should do the trick. were you on MY ROAD!?!? you should have stopped to say hello! i like the soft yellow color! This is certainly a cheerful way to begin the week! Lovely. thanks Jessica the daff is the national emblem of WALES.Great photo. POD. is daffodil already blooming there? You are so lucky, is still pretty barren here. No sign of spring yet! yellow daffodils reminds me of a beautiful sunny morning, nice shots! I hear ya.. it must be contagious cause I have the same fever :) I love the yellow!! 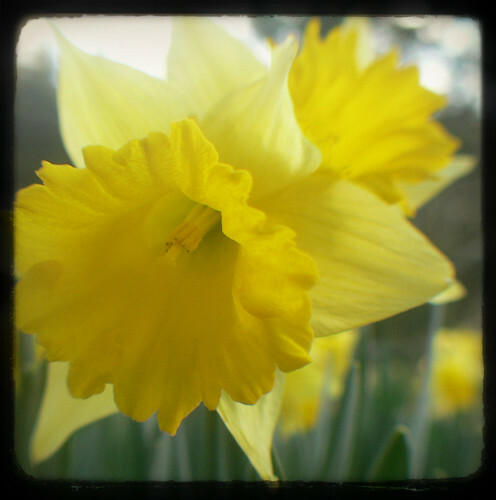 Beautiful yellow daffodils are a sure sign of spring!! A lovely quote to match your beautiful golden Daffodil. Thanks for the free background. I was looking for one. It is wonderful. Daffodils sway and children play. Its a wonderful way to spend a spring time day. i got the fever too. some of the red bud trees are in bloom here - my all time favorite - and the forsythia too! I am with you! Can't wait! Love this image, patiently waiting on my Argus so I can experiment on those spring flowers! i just keep crossing my fingers hoping that it doesn't all get burnt back. NO more FROST. you hear me, God? my tulips have broken ground. it just CAN'T frost again! My dad planted 180 daffodils on my front lawn. I'm not kidding. lol! Just gorgeous! I too, am longing for Spring and new beginnings! it must be spring Cody comes out of hibernation and makes a comment. he he he. They smell good too! Thanks. Love this macro flower and the Mark Twain quote too. Many are currently afflicted with the same fever as you. I CANNOT wait.......I am holding my breath. I long for that fever, I am tired of snow. That's a beautiful shot. I have a little touch of spring fever myself. Come back every week and post marvelous flowers! Boy do I have spring fever too! I am so looking forward to daffodils next month! what a beautiful and inspirational blog you have. Thank you for stopping by so that I now get to check in on all of this!!!!! I am in FL so it's 75 right now and sunny and just beautiful. Thanks to this post I think I will go back outside and breathe it all in again.